I conducted a great mission campaign in Glasgow from September, 1893, to the end of January, 1894. The mission was arranged by a committee of twelve Free Church ministers, and the work was carried on in almost as many Churches. The campaign was interrupted for a short time by the Christmas holidays, and by a short vacation that I took. During this visit to Glasgow I met the late Professor Henry Drummond, who was very kind to me. When he and I first conversed together I had been working for seven weeks in seven churches, and I told him, in reply to a question, that I had not given the same address twice. This statement seemed to impress him greatly. He asked me some questions about my life, and how I prepared my discourses. I was attracted at once by the sweetness of his spirit and the graciousness of his manner and disposition. Henry Drummond at once appealed to the best in you. I have met many great ministers and preachers in my life, but never one in whose company I felt more at ease than Henry Drummond's. There was no subduing awe about him. One would laugh at oneself for being afraid of him, yet he conveyed to one's mind an unmistakable impression of greatness. The late Dr. Bruce attended my mission services, and took part in one of them. I was told that never had he done such a thing before. Dr. Bruce was well-known for his frankness of speech, and, addressing his students, he described the inquiry-room work as tomfoolery. "But," said he, "you must all go and hear the Gipsy. That man preaches the Gospel." Perhaps the most memorable part of my campaign was that in the Free College Church, of which Dr. George Reith was the pastor. Dr. Reith wrote an account of the mission for his Church Magazine. He said: "We have seen nothing like it since the visit of Messrs. Moody and Sankey in 1874. The speaking was remarkable. We have seldom, if ever, listened to a long series of addresses of the kind so admirable in every respect; effective, pointed, and free from sensational appeals . . . . Our friend, Gipsy Smithy has left memories of a singularly pleasant kind, and what is of more importance, his presentation of the Gospel of our Lord will not soon be forgot ten by those who heard it." People of all kinds attended the services - old, young, and middle-aged - the fashionable inhabitant of the West-end, the middle-class citizen, the artisan, the domestic servant, the school-boy, school-girl, and soldier. A member of Dr. Reith's congregation wrote in the Magazine that "the Gipsy's illustrations are usually well chosen and apposite. One evening we observed a fashionable young lady sitting perfectly unmoved through the service, until a touching little story at the close did its work - unlocked at least a spring of emotion . . . . Judicious management of the inquiry-room is admittedly one of the most difficult and delicate departments of evangelistic work, but we are sure no one who remained to confer with Gipsy Smith would ever regret having done so." It took a long time to break down the caution and reserve of the Scotch character, but once it was broken clown it broke down completely. Three thousand people passed through the inquiry-room. A large proportion of these were men. Some of them, indeed, were remarkable triumphs of God's grace. The history of the conversion of some of these men was curious. At first they would be merely interested in the services. Then they would be impressed, and perhaps convicted of sin, and so they were led to follow me from church to church, until, in some cases, they had been listening to me for quite seven weeks before they fully resolved to give their lives to God. At one service, and that the most fruitful, there was no sermon, because the people began to go into the inquiry-room immediately after the hymn. I have no doubt that many of them had already made up their minds, and really came to the meeting with the intention of taking their stand publicly. We spent that whole evening in simply saying to the people, "Come, come!" I think that God taught us a great lesson that night. We are so apt to think that this must be done, and that that must be done, and that a certain fixed course of procedure must be followed or else we must not look for results. Too often I fear our rules and regulations and orders of service simply intrude between men's souls and their God. We all need to be taught when to stand aside. The figures do not indicate with anything like completeness the total results. When the ministers of the city came to visit the individual inquirers, they often found that in the same house there were three or four other persons who had been brought to God during the mission. When a Scotsman is once set on fire, he blazes away at white heat. And so it came about that among the best workers during the closing week of the mission were the converts of the early weeks. I have never met people in my life who could sing Sankey's hymns better than the folks of Edinburgh and Glasgow. The farewell meeting of the mission was held in the City Hall, one of the largest public buildings in Glasgow. It was crammed to suffocation. The North British Daily Mail gave a good account of the services, heading its article, "A Glasgow Pentecost." The platform was crowded with Glasgow ministers, many of whom made very cordial speeches of thanksgiving and congratulation. The Rev. David Low said that he had seen nothing approaching the mission since 1873, when Mr. Moody first came to this country. I was greatly cheered by the statement of my friend, Rev. 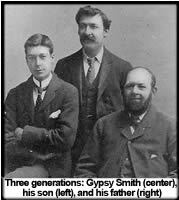 J.J. Mackay, now of Hull, that never had he a worker more delightful to co-operate with than Mr. Gipsy Smith. He was as simple and natural as a gipsy boy. My heart was full of gratitude to God for the great things He had done for us in Glasgow, and to my warm-hearted Scotch friends for their exceeding great kindness. I think it was that night that I enjoyed a little rub at them for their comical and absurd attitude - for so it seemed to me - towards instrumental music. They would not let me have an instrument at the morning service nor at the afternoon service, but I might have one for the evening service. The idea was, I believe, that the morning and afternoon services were attended by staid, sober, decorous Presbyterians, who regarded instrumental music as a desecration of the regular services in the sanctuary. The evening services in Scotland are always more of an evangelistic character, and are intended more particularly to reach the outsiders and the non-churchgoers. I suppose it was thought that instrumental music would please these people, and would not offend their less sensitive, less decorous consciences. Since 1894, however, things have greatly changed, even in Scotland, and most of the Presbyterian Churches, I am told, have now organs or harmoniums. I do not believe for a moment that the result has been a diminution in the solidity and gravity of the Scotch character.